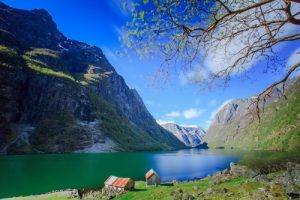 Fjord Travel Norway » Destinations Norway » NORWEGIAN FJORDS: unforgettable! 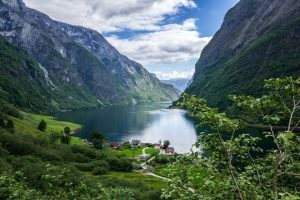 Visit the Norwegian Fjords – A unique travel experience! 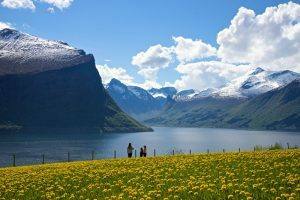 Norway’s vast coastline has an uncountable number of fjords, carved out by the ice during the Scandinavian Ice age. 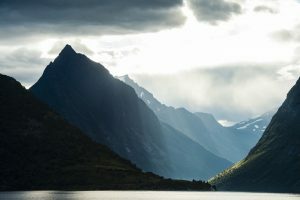 The main Norwegian fjords are located at the Western coast of Norway in the Fjord Norway area, cutting their way towards the inland of Norway. is located south of Bergen, with several branches. The Folgefonna glacier is located on the mountain plateau between the main fjord and the Sorfjord branch, visible from several areas along the main fjord. From the village of Eidfjord the dramatic Maabodal canyon cuts its way inland to the Hardangervidda mountain plateau, with the spectacular Voringfoss waterfall. 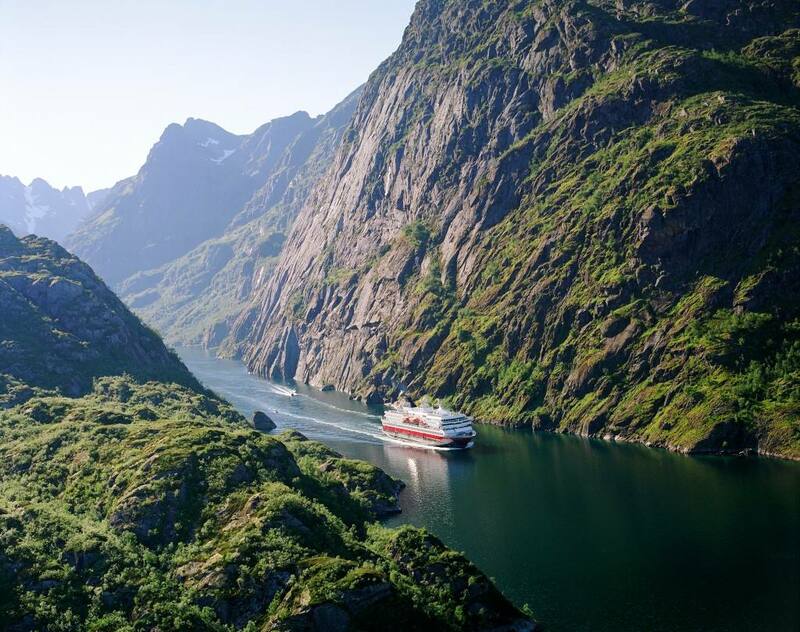 is Norway’s longest fjord, located north of Bergen. 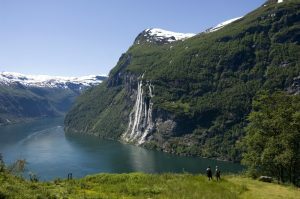 The Sognefjord has several scenic branches, like the Unesco Naeroyfjord and the Fjaerlandsfjord branch. The famous Flam Railway, a side line off the main Bergen line between Oslo and Bergen, takes you down to the Sognefjord and the Flam village in the Aurlandsfjord branch. – a beautiful fjord located south of the coastal town of Alesund, heading southwards inland, with the fjord village of Geiranger in the far end of the fjord. There are marvellous fjord view points in Geiranger area, like the Dalsnibba road and the Eagle’s road. A coach trip across the Golden route mountain roads between Gerianger and Andalsnes fjord village offers stunning views and the breathtaking Trollstigen hairpin road. 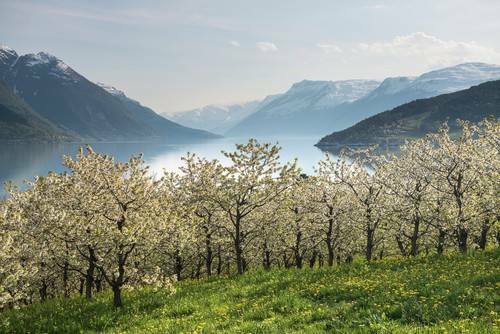 – the narrower branch of the main Sognefjord, with dramatic scenery, steep mountain sides and unbelievable tiny farms clinging to the mountain sides. Gudvangen fjord village is located at the inner end of the Naeroyfjord. From Gudvangen the Gudvangen valley and Stalheim canyon cuts in towards the mountain plateau, with the spectacular Stalheimskleiven hairpin road, offering a marvellous view of the canyon. 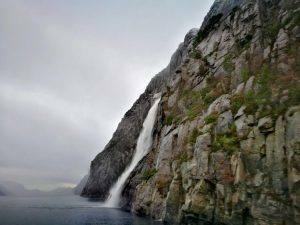 – the fjord is a mighty natural phenomenon. 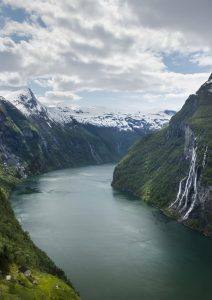 The wild and dramatic fjord cuts its way 40 kilometres into the country between steep mountains. 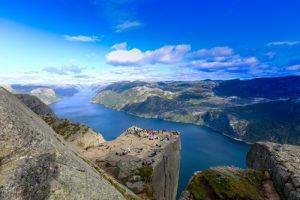 The Lysefjord is carved and formed by the glaciers during the Ice Age. The most famous mountain formation in the Lysefjord is the Pulpit Rock. The plateau or mountain shelf, protrudes about 30 meters from the precipitous mountain and thrones some 600 meters above the fjord. 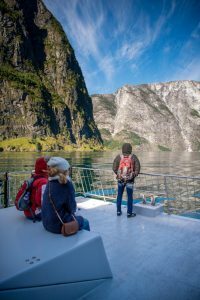 – an amazing, tiny, narrow fjord heading west at the Vesteraalen archipelago, just north of the spectacular Lofoten Islands, with mountain peaks, steep mountain sides and Sea Eagles breeding in the area. 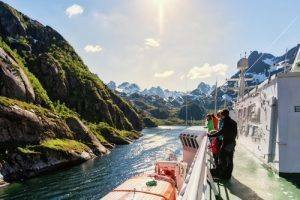 During the summer months the Hurtigruten ships make a detour, depending on the weather situation – an unforgettable experience!! The entrance is so narrow it looks like it is not possible for such a large ship to enter, and it looks even more impossible to turn the large ship at the end of the fjord. 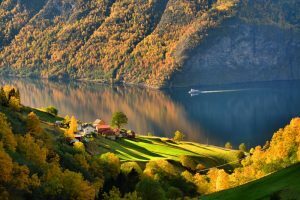 6 nights trip from Oslo, with the Flam Railway & the Bergen line, scenic fjord cruises on the Aurlandsfjord & the Sognefjord, stays in the beautifully located Balestrand fjord village, picturesque Bergen. 5 nights trip starting in picturesque Bergen & finishing in Oslo, with overnight Hurtigruten cruise to the Art Nouveau town of Alesund, with a full day cruise to the UNESCO Geiragerfjord & the spectacular Rauma rail line.